The “Scores on the doors” scheme allows the public to see the results of the latest food hygiene inspection for an establishment in the form of a star rating. Currently under the Freedom of Information Act residents have the right to request this information on inspections of all food premises. The “Scores on the doors” Peterborough scheme allows you to see this information you are legally entitled to view. Peterborough Continental Bakery has 5 star Hygiene Rating! 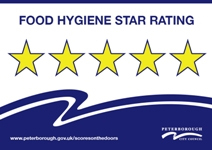 Yes that’s right, we are very proud to be awarded the “Scores on the Doors” 5 star Hygiene Rating and we continue to keep our standards high on a daily basis – being the number one Peterborough Bakery, its at the top of our list! It aims is to raise the standards of food safety for consumers like you in and around Peterborough. The scheme gives you, the public the opportunity to make informed choices about where you’d like to eat or buy food based on food safety, giving you piece of mind. ForPeterborough businesses like us, the scheme serves as a good advertisement for highest standards of hygiene which improve business and reward us for our efforts. Food hygiene and safety – includes food handling practices, food handling procedures and temperature control. Structure of the establishment – including cleanliness, condition of the structure, adequate lighting and adequate ventilation. Confidence in management – evidence of satisfactory documented food safety management procedures, whether there is a good history of complying with food law and acting on previous advice and the attitude of the management towards hygiene and food safety.